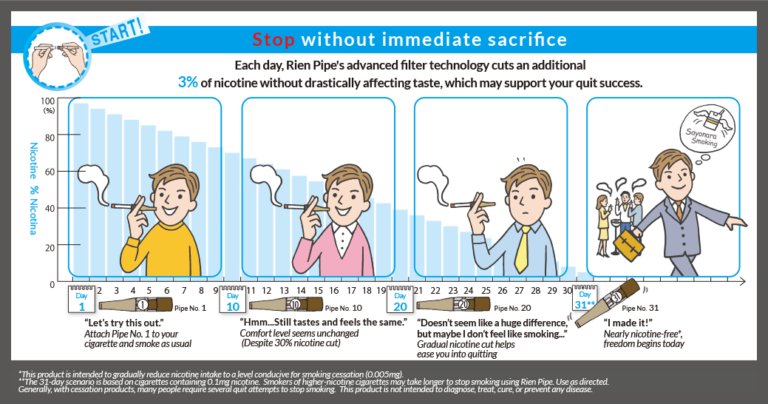 Rien Pipe cuts the amount of nicotine by 3% every day, gradually weaning your body off tobacco. It safely tricks the physiological aspects of the body's central nervous system which tends to be vulnerable to addiction. The daily reduction of nicotine intake by 3% will allow the body to adapt to less nicotine, without trouble. In addition, you can gain the same satisfaction as before. In the end, the essence of the Rien Pipe program is about readjusting your body's craving for nicotine. Imagine how much healthier and vibrant you will feel as your body adjusts to the reduced amount of nicotine each day. At the end of the month and when the 31 pipes have been used, your body will be satisfied even though 95% of nicotine has been cut. If you smoke cigarettes that contain 0.1mg of nicotine and 1mg of tar, for instance, the amount of nicotine will be eliminated almost entirely and you will be in a much easier position to quit completely. The Rien Pipe program doesn't impose a physical or psychological burden. Description Plastic filter that attaches to cigarettes before smoking. Solely intended as a cessation aid. Battery-powered devices which can emit doses of vaporized nicotine. Side-Effects None The nicotine inside e-cig cartridges is addictive. When you stop using them, you are likely to experience withdrawal symptoms including irritability, depression, restlessness and anxiety. It isn't known yet whether the vapor from e-cigs can cause health problems. Effect During the Rien Pipe program, smokers are able to continue smoking, which may have the effect of decreasing anxiety around quitting. Nicotine addiction is broken by the end of the program. Smoking with e-cigarettes may be effective in terms of reducing your nicotine intake if close attention is paid to gradually decreasing nicotine intake. However, their overall success rate in tobacco cessation treatment is not reported to be high. (4) Some smokers have reported that c-cigs let them experience the ritual of smoking, which helps reduce irritation relative to other quit approaches. Cost Benefits After making the initial purchase, you can start saving money you were spending on cigarettes. Rien Pipes are also cleanable and reusable. Very few if any. Smoking e-cigs can be even more expensive than smoking tobacco cigarettes. Description Plastic filter that attaches to cigarettes before smoking. Used in Nicotine Replacement Therapy (NRT), these products supply the body with a small amount of nicotine, which over time helps to suppress withdrawal symptoms. Cost Benefits After making the initial purchase, you can start saving money you were spending on cigarettes. Rien Pipes are also cleanable and reusable. A long-term investment is necessary: quit programs can be up to 12 weeks. You need to keep spending money on these products until you're able to quit. Cost may be reduced through insurance, health plans, or clinics. Description Plastic filter that attaches to cigarettes before smoking. Serve to reduce nicotine withdrawal and the urge to smoke. Most contain no nicotine. Side-Effects None Vary depending on the specific drug, but can include dry mouth, difficulty sleeping, night terrors, suicidal thoughts, nausea and/or vomiting, and mood swings. (3) Many prescription medications list several pages of possible side effects. Effect Nicotine addiction is broken by the end of the program. Many medications have a good success rate. Cost Benefits After making the initial purchase, you can start saving money you were spending on cigarettes. Rien Pipes are also cleanable and reusable. A long-term investment is sometimes necessary: quit programs can be several weeks. You may need to keep spending money on these products until you're able to quit. Cost may be reduced through insurance, health plans, or clinics.